8-Ball - First enemy encountered in a Tournament. Can be seen in Tournament mode (Normal or Frenzied! difficulty). Makes a debut in the Beginner Race. 8-Ball is very heavy, comparing to the light hamsterball. 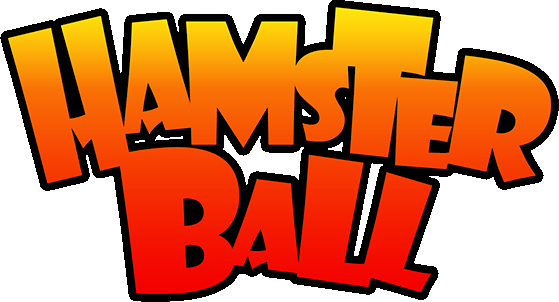 Comparing his weight and high speed,8-Ball has extremely powerful knock back that no hamsterball can withstand. Normally, the 8-Ball just rolls around in circles, but when a hamster approaches him, he will try to bump the hamster off. There is a neon-lighted 8-Ball on the Neon Race. It is possible to avoid the 8-Ball and let him fall out of his spot. If this done in a race, it will break and won`t appear again before restarting the race. If this is done in an arena, it will just reappear on a recovery platform . There is a tiny 8-Ball in the Odd Race , and it will break if you hit it. A 8-Ball in the Dizzy Race is seen only in a background rolling round his spot, his place cannot be approached. In the Neon Race, it is possible to lead the 8-Ball to the goal. However, doing so crashes the game.